The other night, I had an eye-opening revelation. My husband and baby were both in bed, so I took a moment in the silence to do my Bible study. While reading through Mark, I came across a verse that made me stop in my tracks. Stop for a second and let that sink in. Jesus is reminding us that the original purpose of the Sabbath was so that humans could have a day to rest from their work and worship God. But the Pharisees had instituted so many additional rules that people were no longer allowed to meet even their most basic needs. Sometimes, I look at my family the same way. 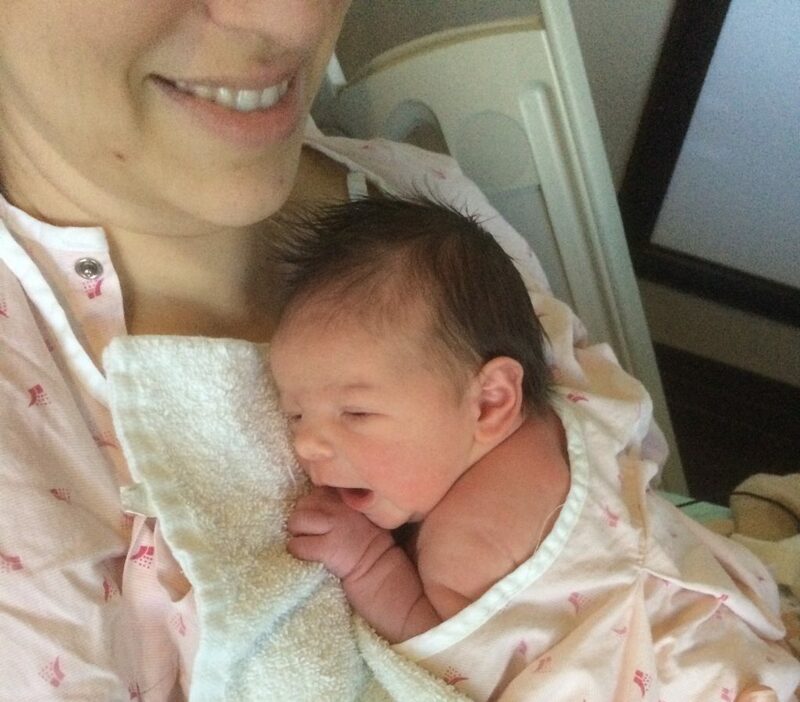 When you were expecting, strangers and family alike reminded you of what a blessing having a baby is. “Congratulations on your little bundle of joy!” they would squeal. “What a precious little blessing!” But after a couple years, the novelty wears off. Sleepless nights. Potty training. Messes. Separation anxiety. Dishes. Parenting has become a burden instead of a blessing. The Bible says that children—like the Sabbath—are a blessing, but even the most well-meaning people have a tendency to let both obeying God and being a parent become a burden. It shouldn’t be that way. During a recent fight discussion with my husband, I had to come to terms with my own attitude as a SAHM, so as I completed my devotional, I asked myself 4 questions. 1. Do I see my family as a blessing or a burden? Mothers have a hard job, so it’s easy to focus on all the work we’re doing for our family and forget about the immense joy they bring to our lives. We focus on the Legos on the floor and ignore the fact that our kids are playing nicely together. We nag our husbands about leaving their socks out and forget about all the work they do so we can stay home. We focus on the never-ending piles of laundry and don’t think about how awesome it is that we can spend the day in yoga pants. We need to keep the right perspective so that we are motivated—not worn down, overwhelmed, or discouraged—by our work. After all, Mama, you chose this career path for a reason. Think about the pros of being a SAHM and try to forget about the cons. 2. 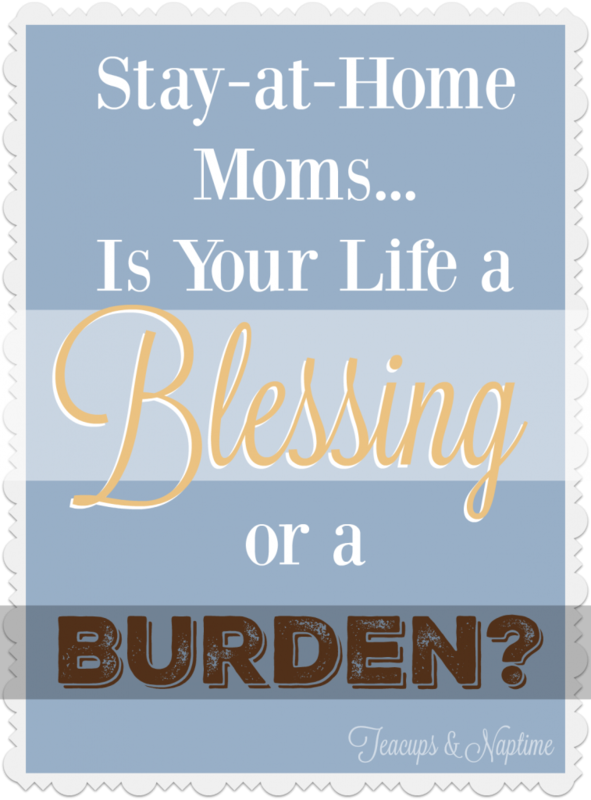 Am I raising my children to be blessings or burdens? They may be little now, but our children have to enter the world one day, and we won’t be there to clean their apartments or check their work before the boss sees it. Our responsibility as parents is to equip our children to contribute to society, not drain it dry. 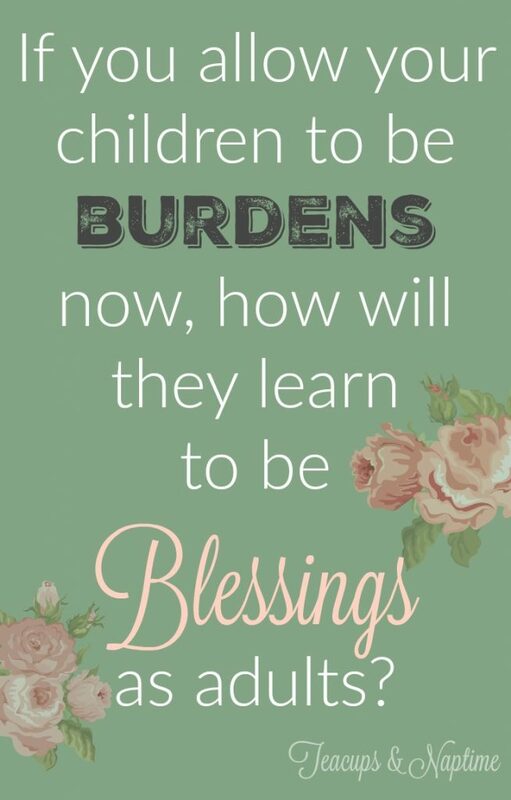 If you allow your children to be burdens now, how will they learn to be blessings as adults? Is it a burden to constantly pick up after your school-aged children? Allow them to become blessings to their future housemates (not to mention you) by teaching them how to clean up after themselves. Is it a burden to constantly remind them to do their homework and then spend an hour or more helping them do it? Have them learn responsibility by putting them in charge of completing their schoolwork (and allow them to feel the consequences if and when they fail). As parents (moms especially), we tend to feel guilty when we’re not sacrificing everything (time, money, energy, happiness) for our kids. “But they won’t be with us forever!” you cry. So let them spread their wings now, while you’re still there to teach them how to fly. 3. Am I a burden on my spouse or a blessing to them? I’ve always said that marriage is about two things: finding the right person and being the right person. You’ve already found the right person, so now it’s up to you to be the best wife you can be. After all, why should you expect your husband to step up to the plate if you’re not willing to do the same? When researching her book, “For Women Only: What You Need to Know About the Inner Lives of Men,” Shaunti Feldman interviewed thousands of men and found out that, if they had to choose, men would rather be respected than loved. (IKR?!) Women are the opposite, so we have a tendency to think, “Oh, he knows I love him, I can talk to him whatever way I want.” But your husband doesn’t see it that way. 4. 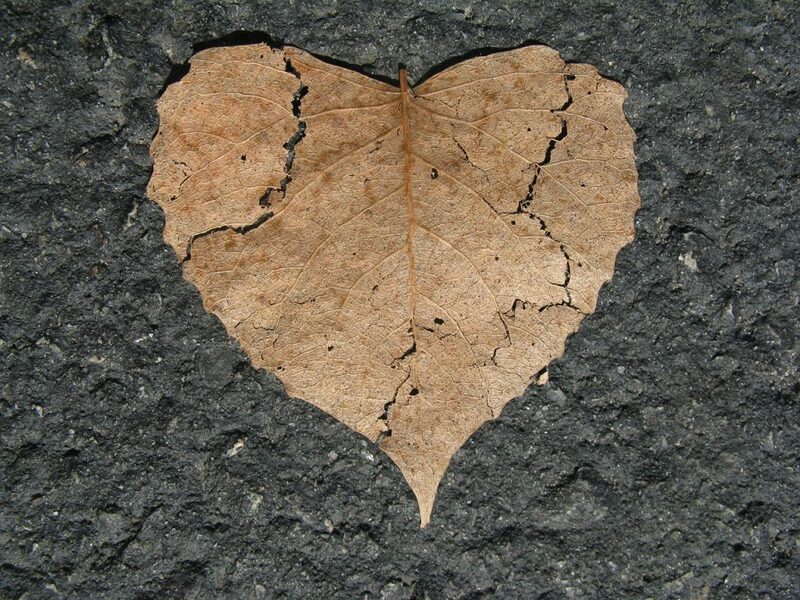 Am I allowing my spouse to be a blessing or a burden? Some women (Christians, especially) take “respect” too far and use it to mean “putting up with bad behavior” or “refusing to stand up for yourself when you are being disrespected.” That’s setting yourself up for a lifetime of resentment. If there are serious problems in your relationship that are causing your spouse or your marriage to feel more like a burden than a blessing, you owe it to yourself, your spouse, and your children to solve those problems head-on. I put these questions in a certain order for a reason: it’s important to look at yourself before pointing the finger of blame. Jesus warned his followers to take the plank out of their own eyes before taking the speck out of their brother’s, but He never said to allow that speck in your brother’s (or husband’s) eye to stay there forever. Your family, like the Sabbath, was meant to bless, comfort, and rejuvenate you. It was designed that way! Turning this gift from God into a burden is not only insulting to Him, it’s miserable for you. Whether you’re a Christian or not, it will bless your life tremendously if you stop seeing your family as a burden and start seeing them as a blessing. I love being a SAHM and am grateful for the opportunity and see it as a blessing. Thanks, Tara! It’s always nice to see you ladies!